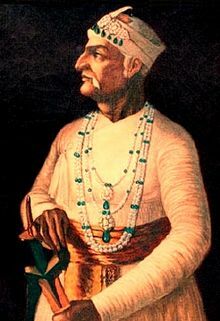 Nizam Ali was appointed as the leading commander and administrator of the Deccan in the year 1759, his successful methods of fighting against the Marathas had earned him much repute as a capable commander. After the Marathas were routed during the Third Battle of Panipat in the year 1761, Nizam Ali and his army of 60,000 immediately advanced and repulsed them as far as Puna and forced them to sue for lasting peace. Nizam Ali then seized the Bidar Fort and later arrested Salabat Jung, this action of Nizam Ali Khan was ratified by the Mughal Emperor Shah Alam II, who issued a Firman terminating Salabat Jung (supported by the French East India Company), from his position as the Subedar of Deccan and appointing Nizam Ali Khan Asaf Jah II as his successor. Asaf Jah II became the Subedar of the Deccan on 8 July 1762. He transferred his capital from Aurangabad to Hyderabad in 1763 as Aurangabad was very close to Maratha Territory and therefore prone to aggression. Immediately after recapturing the throne Shah Alam II in 1772, came under the influence of Nizam Ali Khan the Nizam of Hyderabad. Nizam Ali Khan was very fearful of the rise of highly capable figures such as Hyder Ali and made every effort to downgrade the relations between the Mughal Emperor and the Sultanate of Mysore. In 1762, Raghunathrao allied with the Nizam due to mutual distrust and differences with Madhavrao Peshwa. The Nizam marched towards Poona, but little did he know that Rughunathrao was going to betray him. In 1763, Madhavrao II along with Rughunathrao defeated Nizam at Battle of Rakshasbhuvan and signed a treaty with the Marathas. In 1795, he was defeated by Madhavrao II's Marathas at the Battle of Kharda and was forced to cede Daulatabad, Aurangabad and Sholapur and pay an indemnity of Rs. 30 million. A French general, Monsieur Raymond, served as his military leader, strategist and advisor. The following year, he realized that the fall of Tipu Sultan was imminent and thus, he entered into a Subsidiary alliance with the British East India Company. Thus Hyderabad, which is in both area and population comparable to the United Kingdom, became a princely state within the British Raj. Asaf Jah II died at Chowmahalla, Hyderabad at the age of 69 on 6 August 1803. ^ "Raymond's tomb languishes in neglect". The Hindu. 30 May 2012. Retrieved 30 May 2012.